Nzi is a simple, flexible cloth trap whose ingenious combination of colors and shapes captures larger numbers and more biting fly species than other traps, including horse flies, stable flies, deer flies, and yellow flies. There are no moving parts, and no chemicals or baits are necessary. The main maintenance is the removal of captured flies. Manufactured in the USA from durable marine grade canvas, mosquito netting, and recycled plastic drink bottles, Nzi traps can even be configured to withstand stormy weather. Start with one Nzi trap per 20 acres of infested pasture and add more as needed to get control in your situation. Assembly (directions included) requires one person and 4-10 minutes. Each NZI trap is 6 ft wide, 4.5 ft tall and 2 ft deep, and requires three poles (not included). $10 of the $195 trap cost supports research on biting fly control in Africa and around the world. The present Nzi trap design, tested mainly in Africa, caught thousands of stable flies (Stomoxys spp.) per day in the forests of Kenya’s Nairobi National Park. The traps worked best in sunny locations away from bushes and trees. Octenol or fermented cow urine as an attractant bait increased fly catches in trials, but the traps work fine even without these added attractants. So far, the Nzi trap has been the best biting fly trap design we have tested in North America. “Nzi” is the Swahili word for fly, reflecting the trap’s development in Africa to control the deadly tsetse flies that spread sleeping sickness. The trap mimics the shape of a large animal, as perceived by the fly visual system. The front blue panel is perceived by the fly eye as the underbelly of an animal. Expecting a blood meal from the animal’s “underbelly,” the fly swoops down. But instead of the expected juicy underbelly, the fly is greeted by sunlight pouring down from the top of the trap. The natural fly response is to fly up into the sunlight, where it is stopped by mosquito netting and then channeled into a clear plastic bottle and trapped. Rincon-Vitova is collaborating with Dr. Steve Mihok, a Canadian researcher, to test trap design variations and potential improvements. 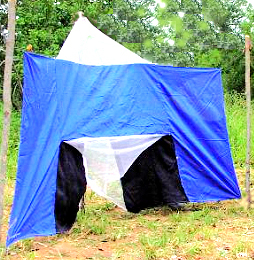 In North America, Nzi traps work best facing west, where afternoons are sunniest, and away from bushes and brush that can obstruct a fly’s line of sight. Even a few small bushes obstructing the view will reduce the number of flies trapped. So far, we have learned that matte black back panels work better than shiny black back panels in the traps. Also, the exact shade of blue for the canvas front panel is an important variable affecting the attractiveness to different kinds of biting flies. We expect continuing research to suggest additional trap refinements. You can build your own traps and test your own modifications: Just follow the instructions at www.nzitrap.com. In many animal rearing situations, the majority of the flies are the common house fly. These are controlled with fly parasites, filth fly traps and manure management. A small number of biting flies can torment the animals and ranch hands. Add a few biting fly traps to your program to remove these pesky critters and improve the health of your animals.